Premiership winning trainer Chris Waller has a great chance to win a fourth Group 1 $1m Epsom Handicap (1600m) at Randwick on September 29 after entering 23 for the famous Randwick Mile Spring Feature. Comin’ Through, above, is among trainer Chris Waller’s nominations for the 2018 Epsom Handicap at Randwick. Photo by Steve Hart. Last Saturday’s Tramway Stakes winner Comin’ Through and Rosehill Guineas winner D’Argento are two of Waller’s main chances that are included in 87 nominations for the 2018 Epsom Handicap. The Waller trained D’Argento has been installed the early Epsom Handicap favourite at $6 with Ladbrokes.com.au while Comin’ Through is on the third line of betting at $12 with his stablemates Unforgotten and Paret while Tom Melbourne is marked at $18. D’Argento resumed from a spell for a third to his super star stablemate Winx in the Group 1 $500,000 Winx Stakes (1400m) at Randwick on August 18 while 2018 Australian Oaks winner Unforgotten was super impressive in winning the Group 2 $250,000 Bisley Workwear Chelmsford Stakes (1600m) at Randwick last Saturday. 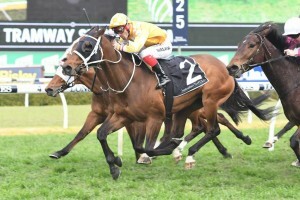 The remaining Waller Epsom Handicap nominations include Group 1 winners Egg Tart, Foxplay, Shillelagh and Single Gaze while last year’s winner, the Pat Webster trained Happy Clapper is also among the nominations.